The scope of delivery given to the Sorion team involved project management, hardware & software design, cabinet manufacture, site installation, commissioning, start-up support and training. Sorion has many years of experience in the development of Electrical Test Systems, with hundreds of systems in operation around the world. The reliability of Sorions equipment and the ability to manage the complex requirements of different end of line tests enables us to become the supplier of choice for leading manufacturers. Working closely with the Jifeng team from the planning phase through to completion, we have built a bespoke, line integrated end of line test unit based on established Sorion technologies. The test system mechanics have been designed to achieve the best performance in terms of reliability, small space requirements and speed, giving the fastest cycle time possible. The Jifeng equipment was made up of a standard Sorion Electrical Test System connected to a bespoke fixture in a soundproof enclosure. The test rig was designed to run through the various individual checks with as few operator interactions as possible. 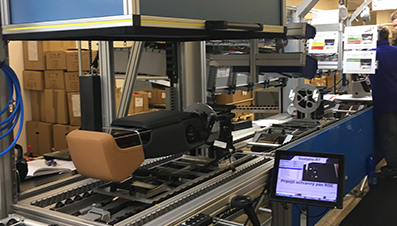 The armrest and headrest motors are actuated in both directions and the performance is measured including maximum and average motor current, distance travelled and time taken to determine that the motors are functioning correctly and the armrest & headrest move throughout their intended range at the correct speed. During these tests, the signals from microphones are enabled so the operator can assess the sound of the movement using headphones and will respond to the system with an OK / NOK verdict. 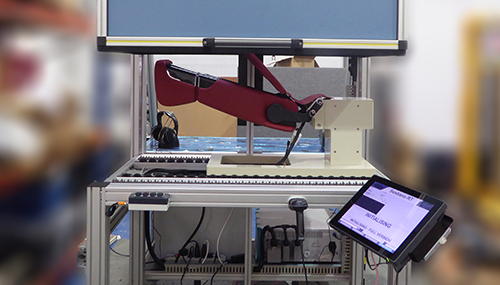 The functionality of the armrest switch illumination is tested automatically by the test rig by switching the illumination on and measuring the current drawn. The tester is configured from a central editing system, using test scripts to interpret data recipes from configuration tables. All scripts were developed in English and the operator prompts were translated to the end user language. 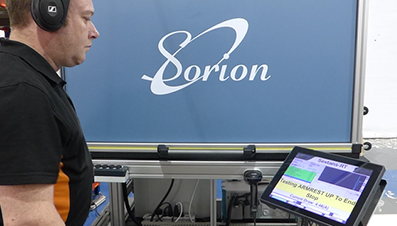 Sorions Sextans test software manages the test process and guides the operator step by step through connecting the armrest and performing the test. A pass or fail label is generated including the armrest ID and date and time of the test. All results are stored in OrionTM, our powerful web based database, allowing for bespoke quality assurance and performance reports to be produced.